I went to see Monsters University last Friday when it opened. It is the newest movie from Pixar, and the first prequel that the company has done. It is set before Monsters, Inc. and tells how Mike and Sulley first met when they were at college. Mike spent most of his time studying, determined to make it through the scare program. Sulley is a member of the Sullivan family, a family well known for scaring, so he is accepted from the first minute he arrives. He thinks he can just coast through because of who he is. Things go horribly wrong during a class. The only chance that Mike and Sulley have to finish the scare program is to work together with the unpopular Oozma Kappa fraternity. The movie is cute, fun, and entertaining. It is nice to see the monsters again, and see them in a different situation. Some other characters that were in the first movie are also in this one. Randall isn't as bad, though there are hints of his true nature popping up every so often - and I don't mean his tendency to go invisible. Much of what happens at the college is a lot like Revenge of the Nerds, but it manages to work. Some people will probably be disappointed that the plot isn't more original. Adults will probably find the movie predictable, but children probably won't. The movie does have a message tied to working hard and working with others. There are some serious moments here and there and a few that are touching, though nothing to the degree of some of the previous movies like UP or Toy Story 3. The humor works without resulting to all the gross humor that so many of the other animated movies resort to. The animation is gorgeous, with bright, vibrant colors in some scenes, and duller more subdued colors in others. A lot of the scenery looks fairly realistic - the grass and trees. Sulley's hair continues to look amazing, though it does have a slightly different look than it did in the original movie. The movie is showing in 2D and 3D. I saw the 2D version. The short before the movie, The Blue Umbrella is very well done. It is a little different from the others Pixar has done, but it is great. There are a lot of different looking monsters around the campus. Some of them are very unique looking. I really like all the different monsters. 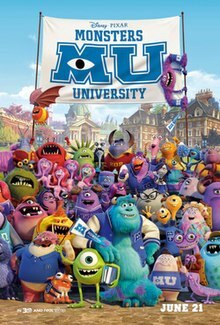 Overall, I really enjoyed Monsters University and think it is a good, interesting prequel to the first movie. It isn't quite as good as the first movie, but it is still very good and way better than most other animated movies. I did post a longer review at Epinions if anyone wants to take a look. I would have rated the movie 4.5 stars there if I had the option. Since I don't, I decided to round up to 5.